This month, I was performing Music for 18 Musicians in Cork, Ireland and at the BBC Proms in the Royal Albert Hall. 2011 marks Steve Reich’s 75th birthday year and I’ve been lucky enough to be singing his compositions since his 60th birthday. I first met him as a soloist in Tehillim played by the London Symphony Orchestra. All of my Steve Reich concerts since, have been with Synergy Vocals the group that grew out of that very fortunate and successful night. We were performing with London Sinfonietta and I was looking forward to seeing a lot of old friends. We flew out the day before and had an evening rehearsal on stage at the Opera House as soon as they’d cleared it. There had been a performance of Reich’s Drumming by O Duo and guests. 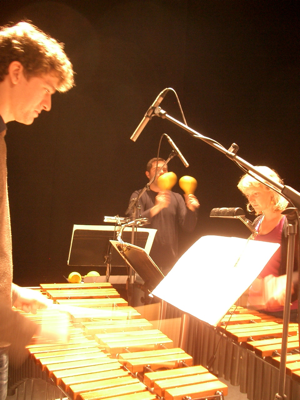 (You might remember Owen Gunnell from O Duo, who played percussion on the videos of my Portrait of a Woman Song Cycle concert. The music for that concert was written by David Newton who’s playing for me on my new album. It’s a very small musical world. The vocal part for me, consists of either fast, repetitive patterns (called the pulses) that crescendo and decrescendo in volume, or the slightly nasal imitations of the string patterns. Keeping the ‘pulses’ absolutely regular is very difficult, especially if you have a rehearsal close to the concert. Tongue fatigue can make you sound very strange in this piece. Again, the repetitive nature of the part can cause tension and vocal tiredness and I have to concentrate very hard to keep my throat relaxed. 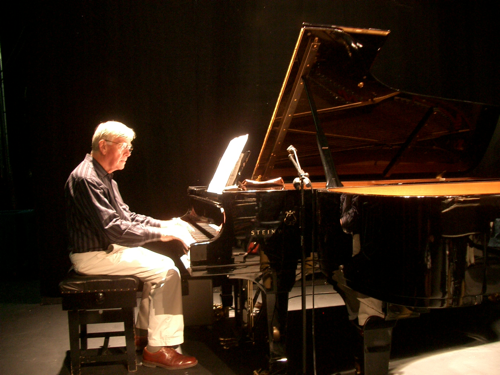 Here’s a picture of John Constable (principal pianist of Sinfonietta), one of the four pianists for Music for 18. I took this photo during the evening rehearsal – the light made him look particularly unearthly, almost as if he was about to be beamed up to the World of Minimalism….far, far away. 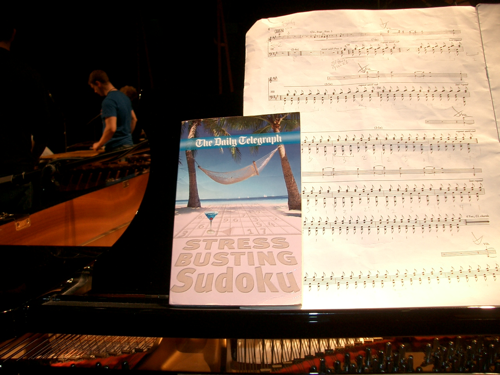 After the break I was amused to notice that one of the other pianists had a Daily Telegraph Stress busting Sudoku book, casually resting on her score. Although some of the content of the music may be deceptively easy, the very nature of it’s repetitive composition make it a huge feat of endurance for all the players. The part written for the maracas, in particular, is famously long and almost athletic in the stamina it requires! 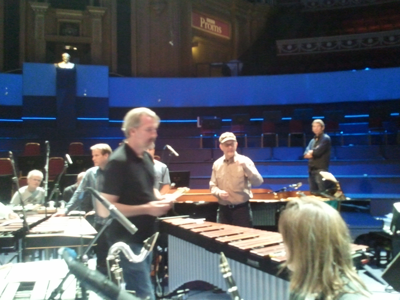 Here’s Sam Walton during rehearsals – in the picture his maracas are a blur! 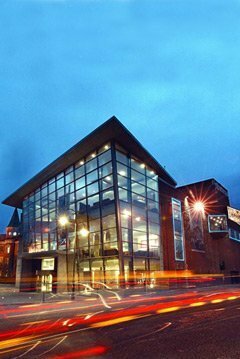 The Cork concert went really well and all credit to the Opera House for putting on such an ambitious project in such a small city. I spent a lovely couple of days taking boat trips to nearby picturesque villages and listening to lively, traditional music in somewhat dubious pubs – a few half pints of the local ale might have been consumed? Purely in the interest of research, you understand. And so we come to the London concert. The first time Music for 18 Musicians had been performed at the BBC Proms. It was a late night Prom starting at 10.15pm. This unfortunately meant we had a rehearsal at 09.30 – this is so the evening prom people can have a rehearsal in the afternoon. We arrived as Mats Bergstrom was rehearsing the beautiful guitar piece Electric Counterpoint. This piece was originally written for Pat Metheny and we’d been lucky enough to hear him play it at Carnegie Hall in the first half of Steve’s 70th Birthday concert along with the Kronos Quartet playing Different Trains. We also performed Music for 18 Musicians with Steve’s band in the second half of that concert – It was a certainly a good evening! That was definitely the mood in the hall and the audience was certainly lively and excited. In fact, Steve remarked to the members of Ensemble Modern in the morning rehearsal that Micaela Haslam, our musical director, knew the piece much better than he did – “I just wrote down the notes!” he quipped. Nowadays, Micaela tends to go and direct a few sessions with any new group which hasn’t done the piece before. She helps them make sense of the very confusing published parts and it means that the rest of Synergy can arrive on the last day of rehearsal to slot in the vocals. We had performed Music for 18 at the Barbican Centre for Steve’s 70th and there was a South Bank Show made to celebrate that. Sections of the live concert were used during the programme. It was really interesting and Steve speaks at length about his life, his influences and his compositions. I must admit, I learned lots of things about him that I didn’t know before. 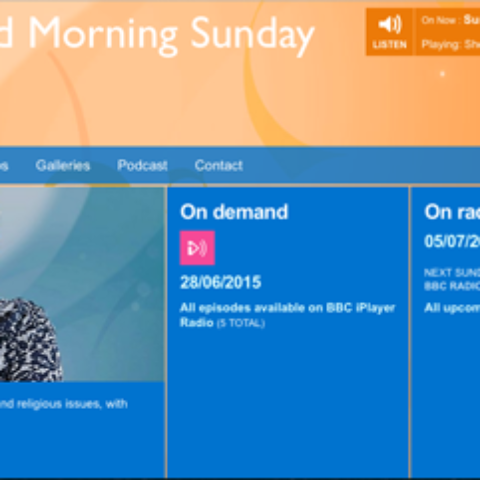 Here’s the first part of that TV show and you can view the subsequent parts on YouTube. Back to the dressing room at the Albert Hall and we were looking at the concert programme and noticed, to our amusement, that the photograph they had used of a previous rehearsal of the piece, was actually taken at the RFH, a performance we did with London Sinfonietta. As we walked onto the historic Royal Albert Hall stage, the crowd cheered with warmth for the composer. When he is there, Steve plays piano and, as a result there were actually 19 Musicians on stage that night. In Ireland we did it with 18 musicians, as one of our brave singers, Amanda Morrison, puts down her microphone and plays the piano pattern with the other three pianists. There is always one other very important musician on the night – and that is the Sound Designer. For London Sinfonietta it was our old friend and long time collaborator Ian Dearden from Sound Intermedia. For the Ensemble Modern, it was the legendary composer and full time Sound Director, Norbert Ommer. For a piece that has such a complicated soundscape, we are completely in their hands to ensure everything work well. Not only being responsible for the front of house sound reaching the audience as the composer intended, but to ensure all the musicians hear the things they need to hear in their foldback monitors. In the case of Music for 18 Musicians, this enables the ensemble to keep together without the benefit of a conductor. In the long seconds of silence at the end of the music, before the crowd erupted into applause, you could hear the distant sound of London’s sirens – quite chilling. Backstage, the official proms photographer took a final picture of the whole band with the composer and I rushed off for a bus to Victoria in order to get the last train home to Brighton. I stood at the bus stop for over half an hour, as other bus numbers came and went. In the end, some audience members hailed a cab. I cheekily asked if I could share it. Then the last man at the bus stop asked if he could jump in too. When I told them I was one of the singers, we had a very convivial chat about the performance, which they’d all enjoyed immensely. Me too! At last – I am officially a Gem! on Performing Music for 18 Musicians in Cork, Ireland and at the BBC Proms.